On Monday, 11 August 2008, the Pátzcuaro Birding Club will leave at 9:00 AM to seek swifts and other birds at Tzararácua Falls, just south of Uruapan. Swifts are the most aerial of birds, the essence of birdness, and some even sleep and mate on the wing. 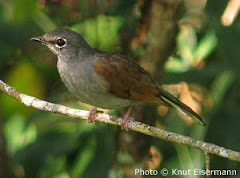 For more information on this field trip see http://patzcuarobirder.blogspot.com/. Tzararácua is good for birding, hikes, picnics, and there is even a tirolesa--a zip line. Hi Tracy, i want to thank you for all the information you post in your wonderful blog, i love how it is full of interesting things. I hope to meet you some time in one of the birding tours,( maybe at my home in Santa Clara).Thanks again.